Q&A: Technology can help some, but not all, prospects for a healthy pregnancy and newborn. Gray areas for would-be parents and doctors. Doug Diekema is an attending physician and director of education for the Treuman Katz Center for Pediatric Bioethics at Seattle Children’s hospital. He’s a UW professor of pediatrics with adjunct appointments in bioethics and emergency medicine. Q. What are the main points of ethical dilemma regarding the beginning of life? A. They start before conception. Parents who find themselves having difficulty bearing children meet with a reproductive endocrinologist or infertility specialist and discuss options and risks. Some of these techniques can lead to multiple gestations. If you have four, five, six babies, do you reduce the number of fetuses in order to optimize survival of the ones that remain? “If you’ve got a neonatal intensive care unit with 30 babies in it, chances are, one or two parents are disagreeing about some medical decisions,” Dr. Doug Diekema said. Above, he speaks at Seattle Pacific University about vaccine refusal. Then when you get into a pregnancy, you have ethical questions related to genetic tests that might lead parents to consider terminating a pregnancy. For instance, if genetic testing reveals three copies of the 21st chromosome, you will have a baby with Down syndrome. Prospective parents need to decide what to do with that information. But things have gotten even more complicated: Now we also can identify genetic anomalies whose prognoses are unclear; they are more associations than certainties. So do you test for these conditions or restrict tests to conditions whose prognoses are more certain? If you choose to test for this information, how do you use it? Who decides whether the test should be available – a physician? Do you let parents decide? Some of these tests are offered as standard of care, but even the standard of care varies from place to place. In this arena, standard of care is more likely determined by professional organizations for genetics, obstetrics and gynecology, pediatrics, which may recommend or create a policy. Q. When more than one professional society is involved, might you end up with conflicting guidelines? A. Yes. Professional guidelines can conflict, but most of the time they are pretty consistent. However, just because a guideline exists doesn’t mean a physician will follow it. For example, the American Society of Reproductive Medicine has guidelines about in vitro fertilization and how many embryos can be implanted, but these guidelines have no real teeth. Some practitioners will ignore and transfer more than the recommended number of embryos. This is how we end up with a woman carrying six or seven fetuses. It’s really only at the point where guidelines don’t seem sufficient and where these high-profile cases become publicly known and cause people to be concerned, that you might get a state to consider regulation. More expectant parents are moving forward with pregnancies in which the fetus is diagnosed with a significant health issue, Diekema said. Above, Dr. Edith Cheng examines a patient with a high-risk pregnancy at UW Medical Center. Q. You talk about the high profile cases; what’s a more typical decision or dilemma that comes into play nearer to birth, and how do those decisions typically get made? A. Certainly the use of genetic screening is one of them. Say you have a woman over 35 who is at increased risk for carrying a baby with a genetic defect. We used to be limited to basic screening for things like Down syndrome, but now we can screen for heart defects, metabolic disorders and lots of other genetic indicators – and all of these tests are being posed as choices to prospective parents: Do you want this testing, and if so, what will you do with the results? If a test indicates the baby will have Down syndrome or another condition, even a minor one, many women will agonize over whether to bring it to term. Others don’t: They know they want the baby or they know they will end the pregnancy. Q. As a physician, how hard is it to have that conversation? A. I’m not an obstetrician, so it’s not a conversation I have often, but they are difficult discussions, especially breaking what may be perceived as bad news about an event that everyone’s excited about. There are healthcare providers who are very good at helping families move beyond that moment and providing information in a way that honors the family’s values. Physicians shouldn’t be applying pressure to families to make a decision so much as making sure they have the resources and information they need to do so. Q. In such cases, do expectant parents have the final word? A. Not always. You may have a fetus with a hypoplastic left heart, based on ultrasound, and you haven’t for some reason discovered this until 30 or 32 weeks. If state law doesn’t allow a termination at that point – which may or may not be what the parents want – then there will be decisions about how aggressive to be in the delivery room, knowing that the baby has a potentially life-limiting condition, and whether you will operate on the baby early in its life. Parents land on both sides of that question. In the 70s, if you gave birth to a baby with Down syndrome who also had duodenal atresia or a significant heart defect, parents could choose not to fix them and the baby would die as a result. We no longer allow parents not to resuscitate a baby born with Down syndrome if resuscitation is needed. We know kids with trisomy 21 can have rich, happy lives, and most people feel it would be inappropriate to just wheel them into a corner of the nursery and let them die. Some of those kids will also be born with intestinal blockages or a minor heart defect that can be readily fixed with a single surgery, and for the most part, we wouldn’t let parents refuse that, either. That can be very painful for parents who do not want to have that baby. Their only real choice is whether to keep the baby or give it up for adoption. Dr. Paul Zarutskie, a UW Medicine reproductive endocrinologist, councils a couple about prospects for pregnancy. The use of fertility drugs has spurred ethical debate. Q. Have you seen shifts in couples’ preferences over time? Q. Any thoughts on what has motivated that shift? A. It’s parents of these babies who have chosen to seek medical interventions. In some cases they’ve had a difficult time; they’ve had to move to a different hospital because the first one wouldn’t operate on a baby with trisomy 18. Some hospitals still have that policy. The American Heart Association, in their neonatal course, identifies trisomy 18 as a condition where aggressive treatment is futile. But some parents of these kids have chosen to treat the defects, and their kids have lived for years with what their parents consider to be a good quality of life. They feel strongly that the advice given by their medical providers was bad, that they weren’t given choices, and that they had to discover that they had a choice and fight for it. So that conversation is now resulting in articles in the medical literature challenging this approach to trisomy 18, suggesting that we should me more forthcoming about the choices parents have with babies with that genetic condition. Q. And not just assume that they wouldn’t want the baby. Q. Do fetuses and newborns have similar rights, or are they very different? A. In the United States they are very different. The argument has gone on for decades, if not centuries, about the moral status of the fetus – whether it is less than that of a newborn or an adult. From a legal perspective it’s been fairly clear in the United States that you’re generally not recognized as a person until you’re born. Roe v. Wade seemed to suggest that a fetus doesn’t have any significant rights before the third trimester. Even after the third trimester, if the mother’s life is in danger, the fetus still has less status than the mother. When you talk about rights, it always gets complicated. There are legal rights determined by legislatures and courts, and then there are moral rights, which end up being points of contention rather than consensus. A medical team at the Maternal and Infant Care Center at UW Medical Center discusses high-risk pregnancy cases in which the prospective mother has diabetes. Q. Are hospitals sued for unlawful birth? A. Yes, and not uncommonly. Two kinds of legal cases have arisen, the first of which is based on a “wrongful life” concept. This was where parents are suing on behalf of their baby, making the claim that the baby would be better off dead, and trying to get damages for its suffering. Those cases are hard to make philosophically because you’re arguing that life is worse than death. That argument has evolved into a variation known as “wrongful birth,” where the parents bring suit and say, had they received certain information – had certain genetic testing or an ultrasound been done earlier, for example – they would have chosen a termination, and now, because they weren’t offered that (testing), they have a baby with a disorder that will add expenses and burden to the family. Those suits have been filed in many states. Q. How are cases typically resolved? A. A study in 2003 showed that those cases had been brought successfully in 26 states, so they do succeed if they meet the conditions of a typical tort case: Parents must demonstrate harm done as a result of a physician breaching a duty. They have to show that the physician failed to offer them genetic testing that is standard or recommended by a professional society, or that the ultrasound was read wrong, or some other lapse – and the result is that we have a baby that has a condition that could have been prevented or for which the parents could have chosen to terminate the pregnancy. Q. Odd that those cases are becoming more numerous even as more parents want to bring children with trisomy 18 into the world. A. Correct. It’s a reflection of the vast differences in our culture regarding how we should make decisions about fetuses and babies with serious medical conditions. And it puts physicians in a difficult position because it seems like they’re vulnerable on both sides of the issue. The only real solution is shared decision-making – not imposing our own values on parents, and not assuming that we know what they think or what they want for their child. Q. How often is it the case that parents and their obstetrician or pediatrician land on opposing sides of an issue, and what happens? Q. Their opinion is strengthened. A. Exactly. So these serious disagreements do happen regularly. 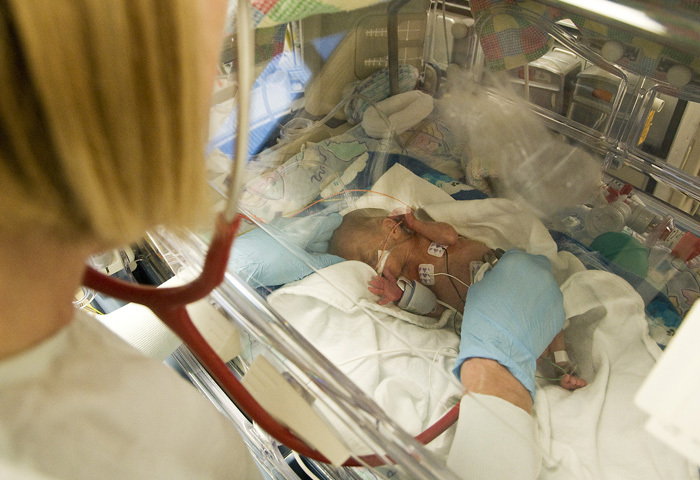 If you’ve got a neonatal intensive care unit with 30 babies in it, chances are, one or two parents are disagreeing about some medical decisions. We haven’t talked about the decisions that take place in the NICU and delivery room every day, which is often focused on babies born very prematurely. Some of those decisions parents are allowed to make and others they’re not. As a very rough rule, NICUs have set gestational ages at which a parent can make a decision or can’t make a decision about whether to intervene medically. Many NICUs will identify a gestational age of viability that’s data-based and have a policy not to resuscitate babies below that age, whatever it is – 20 weeks, 22 weeks – no matter what the parents think. These are babies that, by the data, are very close to nonviable and we don’t resuscitate. Parents are informed of that, and they can sue, but they aren’t likely to win. On the other hand, when you get past, say, 24 or 26 weeks, some NICUs will say, “We automatically resuscitate those babies and see how they do.” If the infant continues to do really poorly, we may withdraw the ventilator later, but we won’t let parents tell us not to resuscitate a 26-weeker, for example, that doesn’t have other serious problems that can’t be fixed. So it’s this middle range in which they might let parents choose, varying between 21 and 25 weeks gestation, where many neonatologists feel it’s a gray area and the odds of a successful outcome are marginal and many of the survivors will have neurological deficits. In those cases they may let a parent choose whether to resuscitate in the delivery room or whether to put a baby on a ventilator. Q. What’s the kindest way for these decisions to play out? A. The optimal way is when everyone’s on the same page. If you think about it, it’s bad enough to be involved as a parent in a drama where your baby’s life is threatened and you have to make these hard decisions. It’s much better to be involved in that situation if you’re in agreement and in a supportive relationship with your healthcare provider. When there’s conflict, it just makes everything worse. Unfortunately, sometimes conflict is inevitable.